Say it loud, Loud! Say it proud, Proud! Horseshoe Spirit, nothing else allowed! Nurturing individuality, cultivating teamwork—these goals are at the heart of each day at Camp Horseshoe. Horseshoe is a spirited, sports-oriented camp that emphasizes participation, healthy competition and a well-rounded summer experience. All elements of our program are infused with boundless energy and the highest quality instruction and activities. Horseshoe boys are encouraged to branch out and explore individual interests throughout the summer. 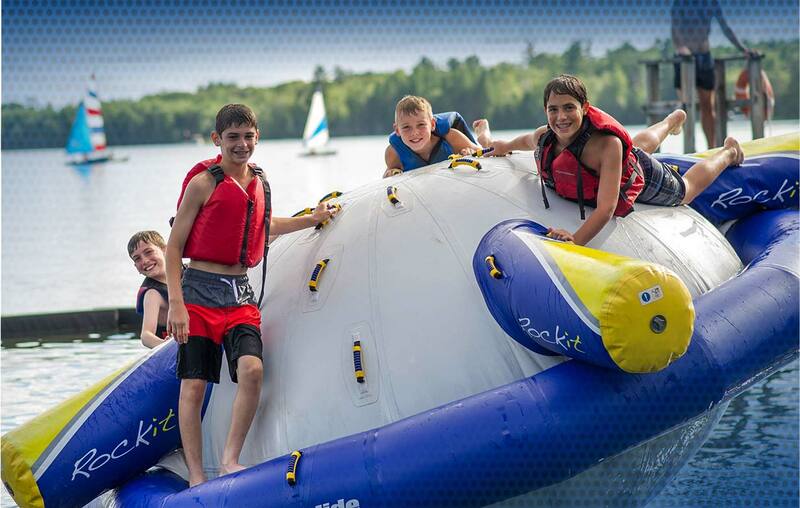 Through Morning Clubs, each camper builds a customized schedule of outdoor adventure, athletics, and waterfront activities. Afternoons at Horseshoe are all about being part of a team. Daily sports league play lets campers thrive in an atmosphere where sportsmanship, teamwork and appropriate competition make every game rewarding. Horseshoe’s innovate trip program sets us apart. As our boys canoe magnificent rivers, cook over an open fire, and sleep beneath the stars, they expand their world and create deeper bonds with camp brothers. At Horseshoe, every day is fresh, innovative and fun! Our well-rounded program offers the ideal balance of choice based activities, skill building, team sports, and special events. Each week boys have the opportunity to create their own schedule. Through morning clubs, campers explore individual interests and develop skills. Campers can learn how to “shoot rapids” in canoes, “shoot hoops” on the court, “shoot a bulls-eye” in archery, and so much more. Afternoon activities include exciting league sports. Boys are grouped by age and compete in a variety of sports including floor hockey, tramp ball, football, baseball, basketball, and soccer. Every evening includes a thrilling Evening Activity such as Treasure Hunts, Capture the Flag, Championship Night, socials with local girl’s camps, Casino Night, and more!